Fear not, for it is just Evergreen. Large in stature, this beastly boy looks like a tank, probably hits like a tank but has the personality of a skittish deer. Of course, first impressions have left many in his past flabbergasted. He is heavy, most notably burly with a large stomach and round cheeks. His ears are comically smaller than the rest of his face, and follow the theme of roundness. Opposite to tiny ears is a large black nose. Perhaps the only striking feature of Evergreen is his striking green eyes. His coat, thick and forcing the ever large male to appear even bigger, forms a mane of fluff around his neck. It continues it’s long length across his stomach and over the back of his hindlegs and tail. His paws are massive. Despite his large size, his paws dwarf him, almost making it look like Evergreen could have even grown larger; a behemoth among others. Coloration wise, the wolf is primarily differing shades of brown; agouti-like in patterning across his back. 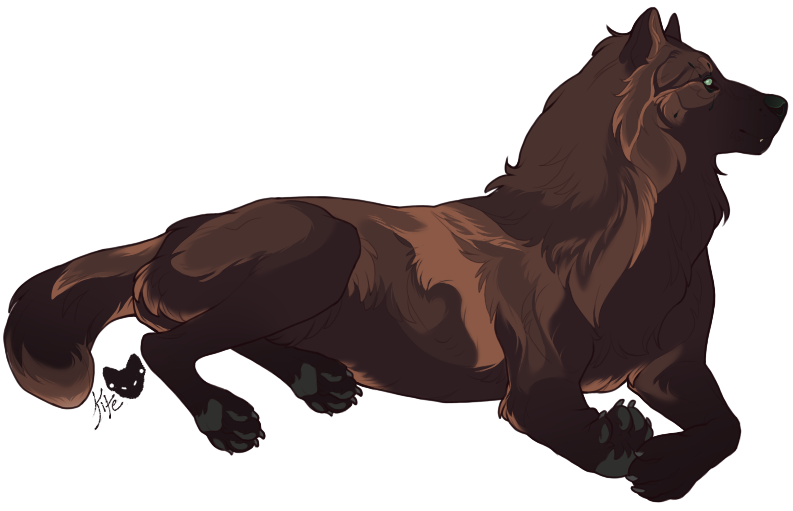 He has dark cherry undersides, muzzle, ears and a blaze. On his left cheek, he has a single cheek dot. His mother named him Evergreen after his distinct woodsy scent. xi Evergreen’s appearance is inspired by the Kodiak Bear, mista’s favorite animal. x His physique, while mirroring that of a bear, is also inspired by athletes known as “strongmen”, such as “The Mountain” from GoT. x Speech patterns include common pausing with “uh”, “oh” and similar noises. xii During a battle with Moath, Evergreen received permanent damage to his right eye. Abandoned, Evergreen was adopted at two months old by a woman named Oki, and her brother, Kaisyn. They raised Evergreen in a family pack. At two years old, Oki told the kids to set sail and get outta the nest. Evergreen arrived in Teekon Wilds after months of travel with his adopted sister, Thistle. Check out my OOC account for additional information. Evergreen is just so lovely and I adore your writing. ?